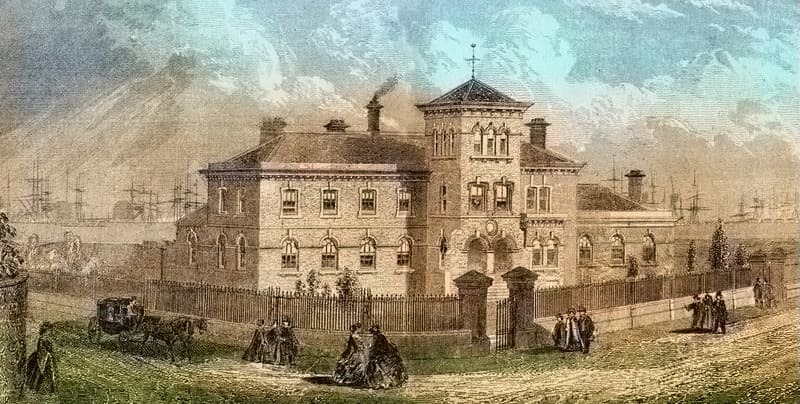 To begin with, the founding of Sunderland East End Orphan Asylum came about in 1853. Indeed, this was after the Sunderland Orphan Asylum Act of 1852 came into force. However, it wasn’t until Thursday 17th October 1861, that the Sunderland Orphanage opened on the edge of the Town Moor. Not only did the Bishop of Durham help fund the building, but the Freemen of Sunderland did too. The owners of the Town Moor, the Freemen and the Stallingers, obviously had rights to the land. So, to help fund the £4,000 orphanage, they used the the proceeds from selling access rights to the land. Of course at the time, railways were expanding rapidly. So, the railway companies took up the offer without delay. Even Queen Victoria gave £100 towards the cost when she saw the plans. 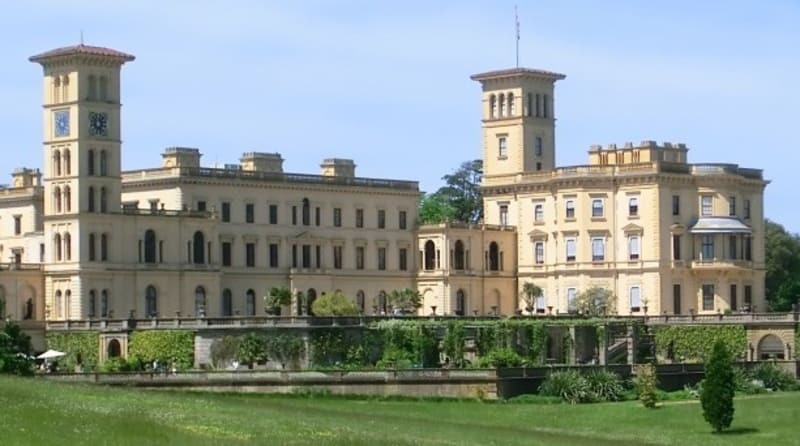 This is because it reminded her of her own residence and summer retreat, Osborne House on the Isle of Wight. In fact, the the design of the purpose-built Sunderland Orphanage incorporates a Belvedere Tower similar to that of Osborne House. Later, of course, Queen Victoria would also donate to the Victoria Hall disaster fund in 1883. So she seemed to be a generous monarch who had a healthy interest in Sunderland. There was an architectural competition in order to obtain designs for the new Sunderland Orphanage. Of course, we saw this with Sunderland Town Hall too. Obviously in those days, these types of competitions were commonplace. However, unlike the Town Hall, it was the runner-up design of Childs and Lucas that won the contract. Since, Childs and Lucas were from London, it was Sunderland architect, Thomas Moore who was to oversee the construction. Thomas Moore was more than capable of completing the task, after all, he was responsible for the iconic Monkwearmouth Station. 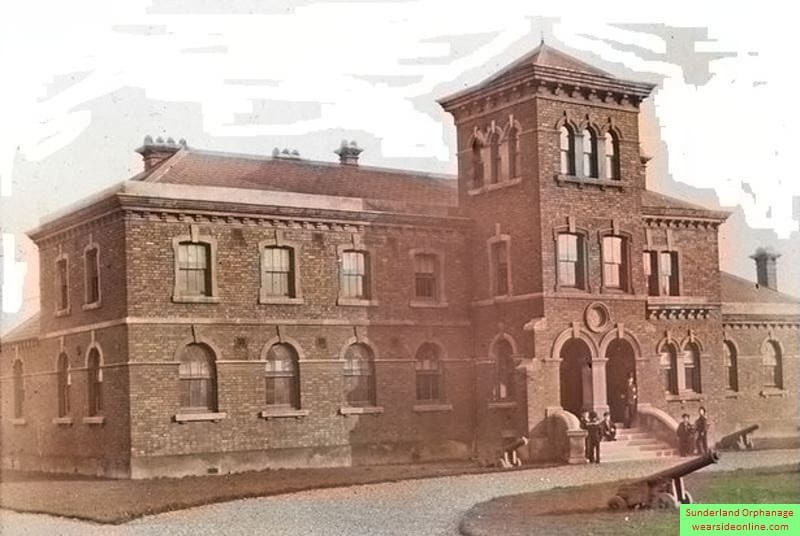 However, while Monkwearmouth Station was of a Greek Revival design, Sunderland Orphanage was totally different. In the mid 1800’s, there was a slight trend for the fashionable Italian Renaissance style buildings. Therefore, Childs and Lucas’ design followed this trend for the Sunderland Orphanage. In short, the building is a two-storey construction, mostly using common bricks. However, it has a ashlar base with various ashlar dressings around the windows, chimneys and entrance. In fact, the keystones above each arch and widow are very striking. Of course, the grand, three-storey Belvedere Tower is the entrance to the orphanage. Built for 50 boys from the homes of lost seamen, it also took in illegitimate children. In addition, the intention was to train the children to become seamen themselves. Obviously, their education included much nautical guidance. There was also a sailing ship in the grounds to help familiarise the kids with rigging etc. With this in mind, they had to wear uniforms in the style of a sailor suit. Prominent members of the local community also became principals of the orphanage. Without delay, the principals formed a governing body. In other words, they became the committee responsible for the running of the orphanage. Of course, one famous principal was John Candlish. The first master of the orphanage was Mr John Clark, then later, there was another appointment of Mr George King. While the orphanage masters came and went, the original name of Sunderland Orphan Asylum stayed the same until the 1930’s. Then, Captain Hague became master and called it the Sunderland Boys Orphanage. Furthermore, around the same time, the inmates had the right to wear long trousers. The slight change in the boys’ sailor uniform still meant that others could identify the children as inmates. Indeed, this was a stigma which the boys had to live with. However, despite this and the strict rules and regulations, the Sunderland Orphanage was always full. Moreover, according to some reports, the boys could be in no better place. As a matter of fact, in 1938, a Sunderland Echo reporter said the boys were living in paradise. Indeed, he called the boys ‘Sunderland’s Lucky Orphans’. The reporter also said that the quality of food was excellent. However, according to a report by one of the boys who had lived in the orphanage, this was not so. His report claims that preparation of the breakfast was on the night before. So that at the breakfast table, “you had two rock hard slices of bread to get your teeth into”. He continues, “of course we soon learnt to overcome this”. Then the boy explains how he would make the bread more edible using a trick. Indeed, he would place his tin mug of cocoa on top of the bread and the heat would soften it. This, however, was before Captain Hague had taken over. Of course, after he became master, the conditions and the meals did improve a little. For breakfast the boys started to get a boiled egg, cornflakes and butter on their bread! Life in the orphanage was obviously not all roses as some boys were persistent at trying to run away. However, their uniform was a give away, so their capture and return to the orphanage was pretty quick. Of course, punishment was the end result. One boy in particular from Seaham had actually hated the place and was always running away. But it was only years later that he learned the orphanage was sick of him also. In fact, if he had run away once more they would have thrown him out! On learning this, one lad said, “What! If I’d known that, then I’d have run away again”. Obviously, the boys should have been grateful there was somewhere for them to go. This is because life was not easy in those days, especially without a father or breadwinner. But for some, they were only grateful when they could actually leave. Obviously, many of the boys that left the orphanage joined the forces and some even earned commissions. Some died in the war and others became ship captains, but they were all heroes. In essence, they lived through some rough times on Wearside. In the 1990’s, after usage by some community groups, including the East End Community Association, the building fell into disrepair. Then it became derelict and boarded up. However, the orphanage is still there to this day and has a degree of protection being a grade 2 building. Indeed, some original featured remain intact. For example, the odd ornate fireplace and some original decorative tiling are still there. 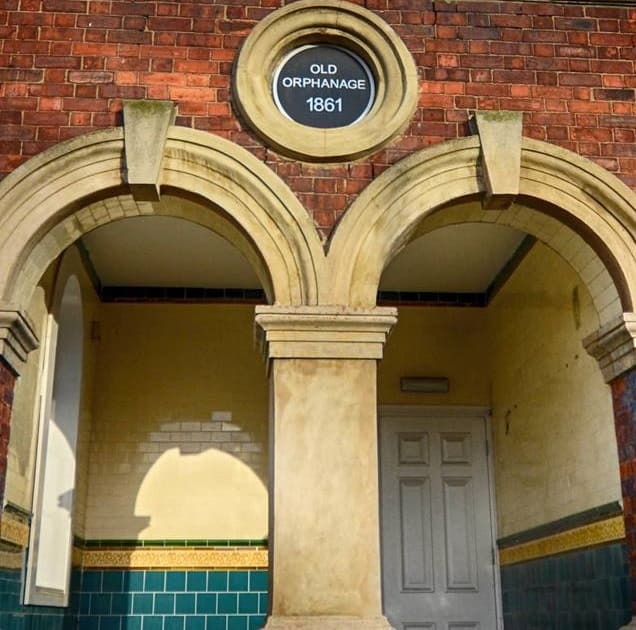 All in all, the Sunderland Orphanage has a colourful history. So, lets hope the building gets a new lease of life soon. Tagged Architect Thomas Moore, Belvedere Tower, Childs and Lucas, East End Community Association, Sunderland East End Orphan Asylum, Sunderland Orphan Asylum, Sunderland Orphanage, Thomas Moore Sunderland. Bookmark the permalink.